A fence that’s not tall enough won’t be able to contain an excited big dog! If your Christmas or holiday season involved a puppy that is rapidly becoming a pretty big dog, you might be interested in getting a fence for the springtime to feel safe letting your pets out in the yard. Here are some simple things to consider when getting a fence for a big dog! 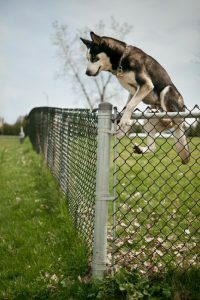 Most homeowners realize that big dogs need big fences, but many forget that their dogs can jump pretty high when deciding which height will work. If you have a big dog, you should be installing a fence that is at least 5 or 6 feet high. Height is not the only thing you should keep in mind either, as big dogs can also be very strong dogs. Make sure that you choose a fencing material that can scale up accordingly and hold up to an eager dog looking for a squirrel on the other side. When you choose security fencing for your home, you make sure that the model you choose isn’t’ easy to climb. A fence for a big dog is really just a security fence for your big dog, so make sure that your dog cannot grab onto or climb your fence at any point. If your dog spends a lot of time in your yard, we guarantee that he spends a lot of it trying to figure out how to get over the fence. If your dog is a climber, stay away from chain link fences that offer easy footholds to renegade rover. Many homeowners think of getting invisible fences when they need a fence for a big dog, but many times they aren’t always the best option. Invisible fences have been shown to actually worsen behavioral problems in pooches, but regular fences almost always do the trick. This entry was posted on Friday, February 3rd, 2017 at 9:34 pm. Both comments and pings are currently closed.